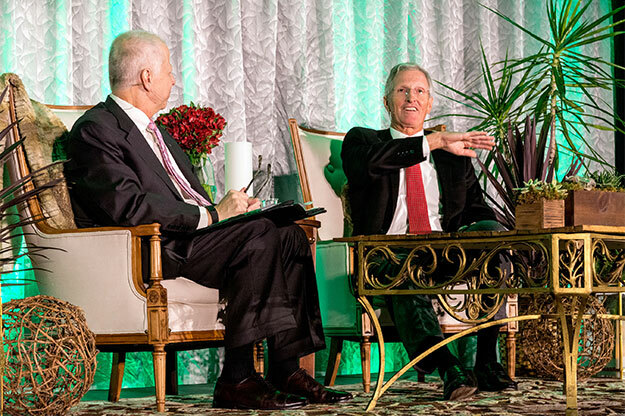 Former Cargill, Inc., CEO Greg Page came back to UND to speak at his alma mater’s 12th Annual Olafson Ethics Symposium. The symposium, established and supported by UND alumnus Robert Olafson and SEI Investments Co., is designed to engage students, alumni and local business leaders in conversations regarding ethical decision-making. Photo by Richard Larson. 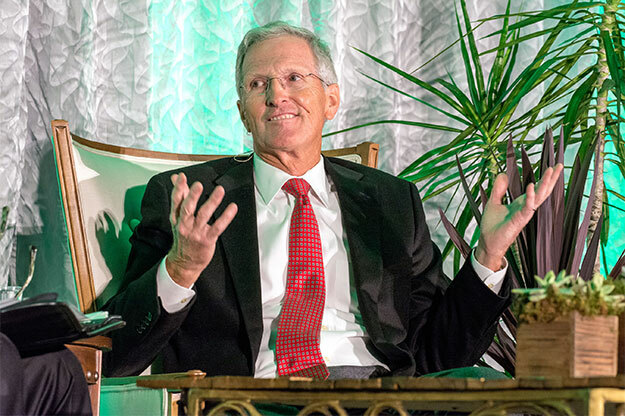 When Greg Page applied to work for Cargill, Inc., as a young man fresh out of UND’s College of Business & Public Administration (CoBPA) in 1974, he told the interviewer he only planned on being there two years before going to work for his father. 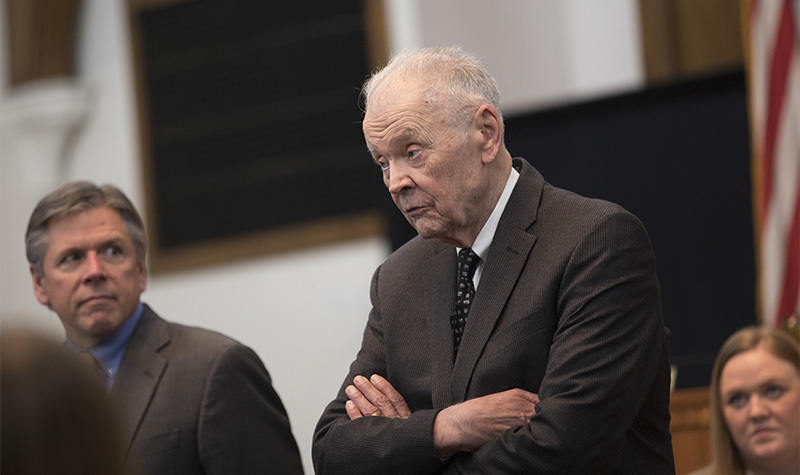 Page got the job anyway, but a lot happened in the 42 years since he was first assigned as a trainee to the agriculture and industrial support giant’s feed division. He recently retired as Cargill’s chairman and chief executive officer. “I stayed because of the family and the way they treated the organization from a growth standpoint,” Page said. Cargill — one of the largest privately held companies in America — provides food, agricultural, financial and industrial products and services to the world, according to its website. Though he graduated from UND with a degree in economics, Page attributes his success at Cargill to the UND Department of Accountancy. Page, a native of Bottineau, N.D., also credits his roots for helping him develop the work habits needed to succeed. Page (right), a native of Bottineau, N.D., credits his roots for helping him develop the work habits needed to succeed as a longtime businessman and head of one of the nation’s largest privately held companies. Photo by Richard Larson. On Thursday, Nov. 3, Page came back to UND to speak at his alma mater’s 12th Annual Olafson Ethics Symposium. The symposium, established and supported by UND alumnus Robert Olafson and SEI Investments Co., is designed to engage students, alumni and local business leaders in conversations regarding ethical decision-making. 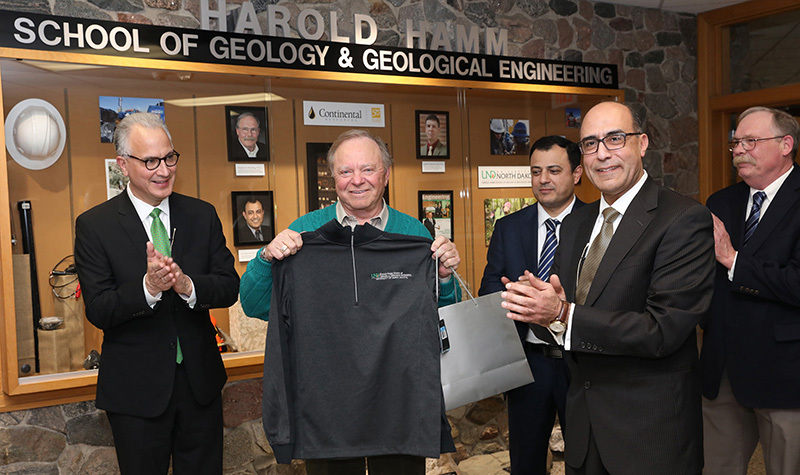 More than 350 people attended Page’s lecture in which he discussed his experiences at Cargill, as well as the ethical standards the company highly values. Both Page and Olafson feel that ethical decision-making should be a part of everyday life. Page’s visit came less than a month after Sally Smith, another high-profile business alum, was the featured speaker at this year’s annual Mellem Business Symposium, also hosted by the CoBPA. Smith is the CEO of the popular bar-and-grill franchiser Buffalo Wild Wings. 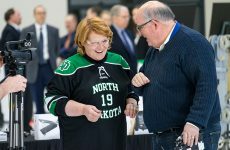 In addition to donating his time to UND, Page gives back financially. He is a frequent donor to the CoBPA in the form of student scholarships and other support gifts. For the 2015-2016 school year, Page awarded scholarship money to 29 different students. Though he’s recently retired, Page says he’s finding ways to stay busy. Page currently serves as a member of the board of directors of Eaton Corporation, Deere & Company, and 3M. He is a past chair of the board of Big Brothers Big Sisters of America, and immediate past president of the Northern-Star Council of the Boy Scouts of America. Page is a past winner of the Sioux Award, the highest honor given by the UND Alumni Association & Foundation, and he also received an honorary Doctor of Letters degree from UND this year.